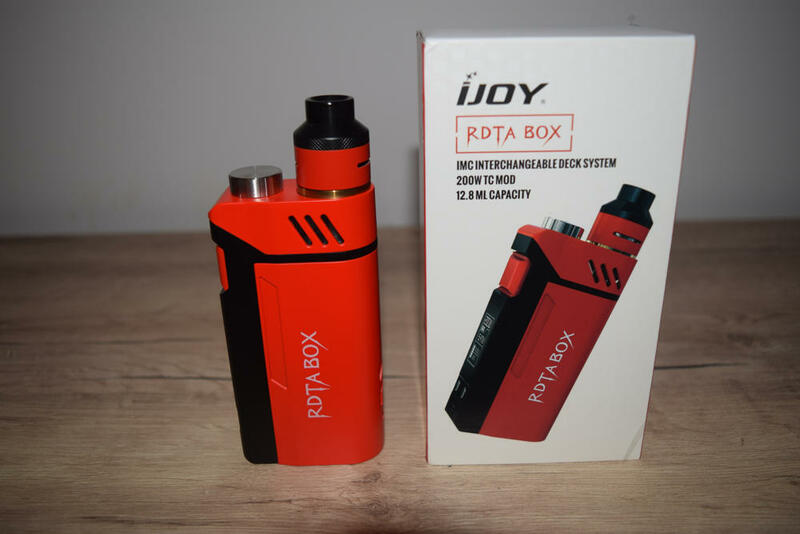 The iJoy RDTA Box is an all-in-one vaping device designed by Chinese manufacturer iJoy in collaboration with popular YouTube reviewer VapingWithTwisted420. 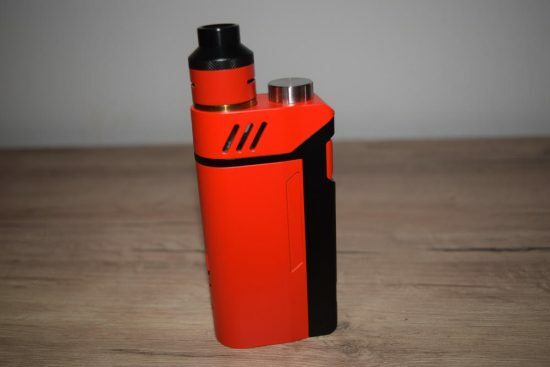 It features a massive 12.8 ml e-liquid tank, 200W maximum power output, interchangeable RDA build decks, as well as temperature control and various other advanced options. This is definitely one of the most interesting devices to come out this year, so when I was approached about doing a review of it, I jumped at the opportunity. Let’s see if the iJoy RDTA Box 200W is as good as it sounds. The first thing that really caught my attention about the RDTA Box was the involvement of VapingWithTwisted420 in the design process. Not only is this guy hands-down the most hilarious vape mod reviewer on YouTube, but he also knows a thing or two about vaping devices. 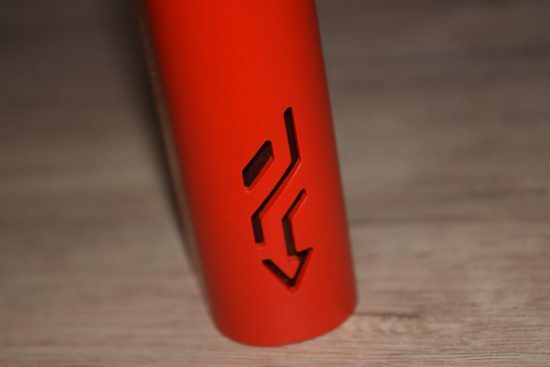 I personally think that taking into consideration the input of prominent figures from within the vaping community, who actually know what the community wants, is a stroke of genius, so kudos to iJoy for making it happen. 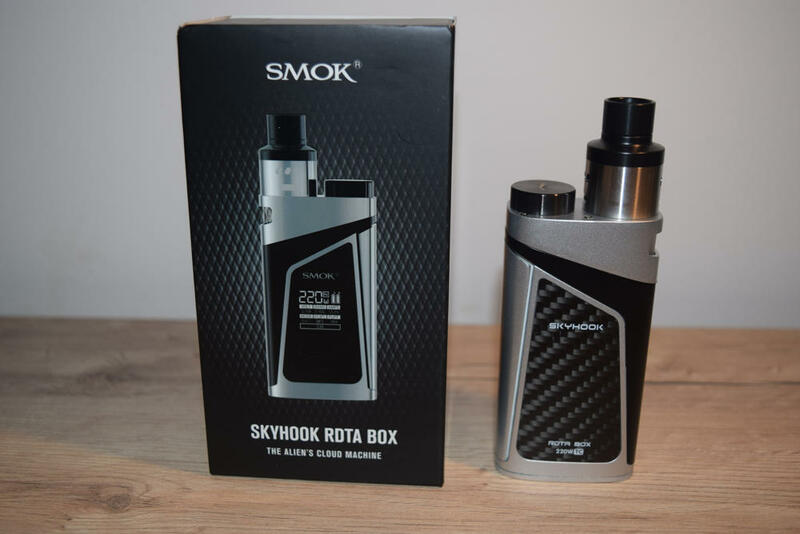 If the RDTA Box turns out to be a hit – and I suspect it will – we’ll probably see such collaborations in the future, and that’s something I’m very excited about. 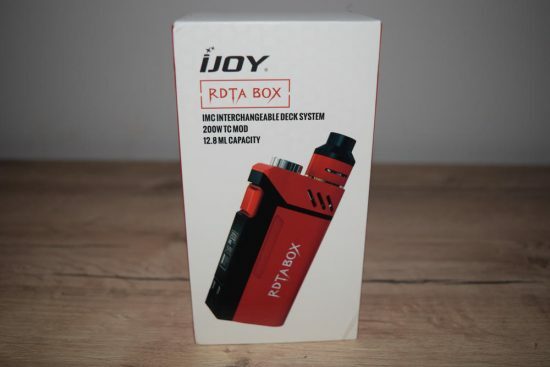 The iJoy RDTA Box comes in a large red-and-white cardboard box featuring all the necessary information and warnings. 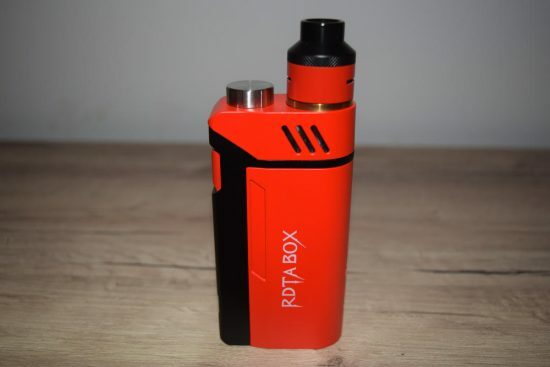 The kit contains the RDTA BOX mod, a disposable pre-made coil – the same one that comes with the iJoy Combo RDTA – a removable Velocity-style build deck, a USB cable (for updates only), a 510 drip tip adapter, a goody bag (Clapton coils, some cotton, spare o-rings and screws), a Phillips head screwdriver, a small plastic brush (probably for fluffing up the cotton), two silicone covers, and a user manual. As you can see, the iJoy RDTA Box comes with plenty of accessories, some of which I haven’t even seen before. Measuring 135mm x 55mm x 28 mm, and weighing a hefty (….) grams with the batteries inserted and a tank full of juice, the iJoy RDTA Box is quite large and slightly heavier than most dual-18650 mods. 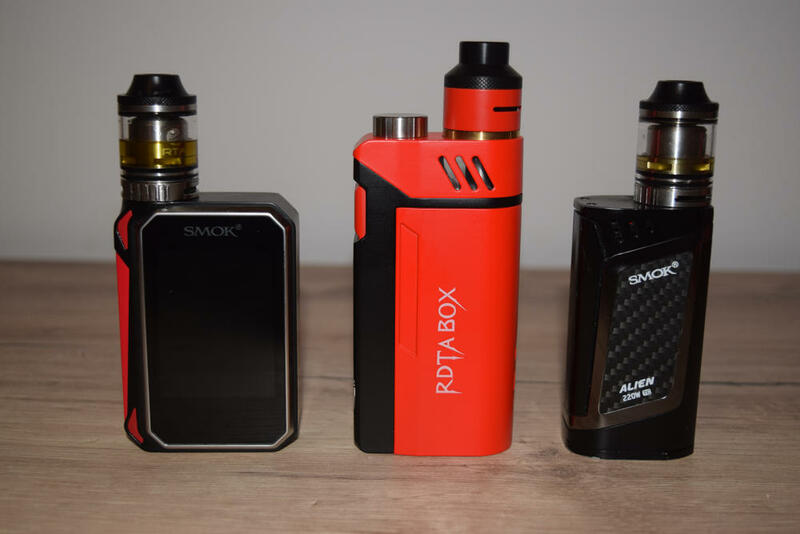 If you prefer slick, light vaporizers, and don’t care too much about the special advantages of an all-in-one device, you may want to go with something else, like the SMOK Alien. 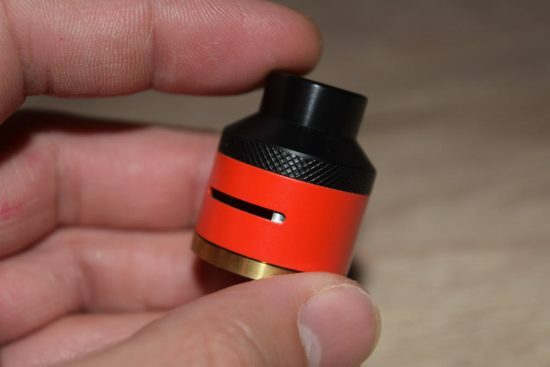 But you have to keep in mind that the whole top section of the RDTA Box is taken up by the massive built-in tank. Without it, this mod would be comparable in size to vaporizers like the H-Priv or X Cube 2. As it stands, it’s just slightly smaller that the iJoy/Limitless LUX, which definitely puts it in the extra-large category. Despite its large, bulky frame, the iJoy RDTA Box feels surprisingly comfortable in your hand, thanks primarily to the curved design of one of its sides. You basically want to hold it with the LED screen side facing away from you, and just press the firing button with your index finger. Speaking of the firing button, excluding firing bars, this is by far the largest power button I have ever seen on a mod. It’s literally as wide as the narrow side of the device and just as tall, which makes it very easy to press. This was apparently VapingWithTwisted420’s idea, so if you like it, he’s the guy you want to thank. The large metallic battery cover is also very interesting. Instead of the popular magnetic locking system, iJoy went with a cleverly-designed one that simply slides on and off and locks firmly into place thanks to a number of ingenious notches. There is absolutely no rattling and the chances of it coming off while you’re using it are virtually non-existent. You actually have to apply quite a bit of pressure when pulling it off the mod, so the only way I can imagine it coming off by mistake is if you dropped the device from up high, on a hard surface. 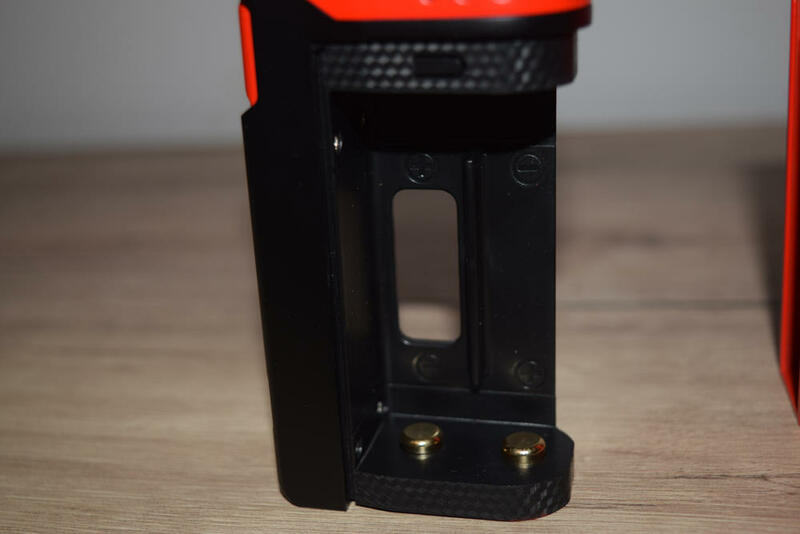 On the flat side of the iJoy RDTA Box we have the massive firing button, a huge, bright LED display that you can clearly see even when holding the mod at a full arm’s length away, two small metallic adjustment buttons, and a microUSB port all the way at the bottom. This port can currently be used for firmware updates only, so you’ll need an external charger to recharge your batteries. But the really interesting part of this device is the top section. 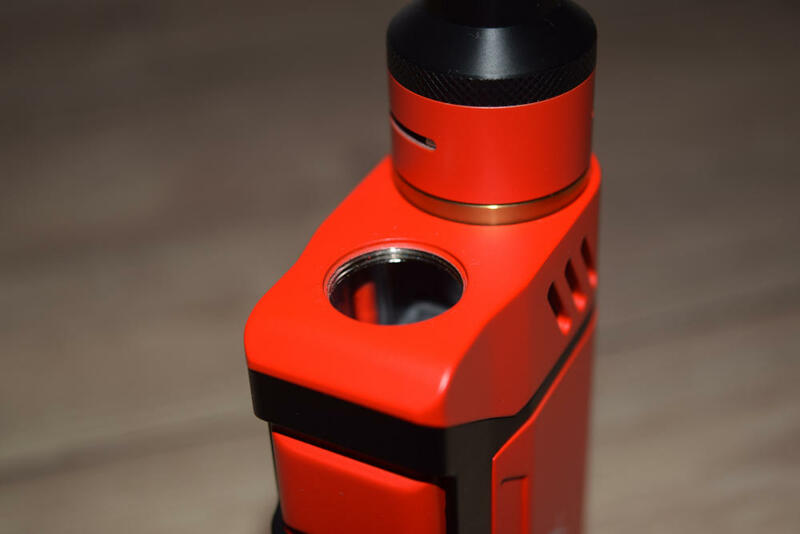 Here we have a humongous tank built into the body of the mod, with a 510 connection sticking out of it, on which you can mount a variety of RDA decks as well as pre-made iJoy coils. Interestingly the RDTA Box is compatible with all the interchangeable decks of the iJoy Combo RDTA, which makes this device highly customizable. Finally, we have the same RDA top section as the Combo RDTA or the iJoy Limitless RDTA. The built-in tank of the RDTA Box holds a whopping 12.8ml of e-liquid, more than enough to keep the vast majority of vapers blowing clouds for at least one day, without having to worry about refilling. Depending on the coil build, I was able to between a day and two full days of heavy vaping on a full tank, which was awesome. Keeping an eye on the level of e-liquid in the tank is very easy, thank to a couple of very useful features. 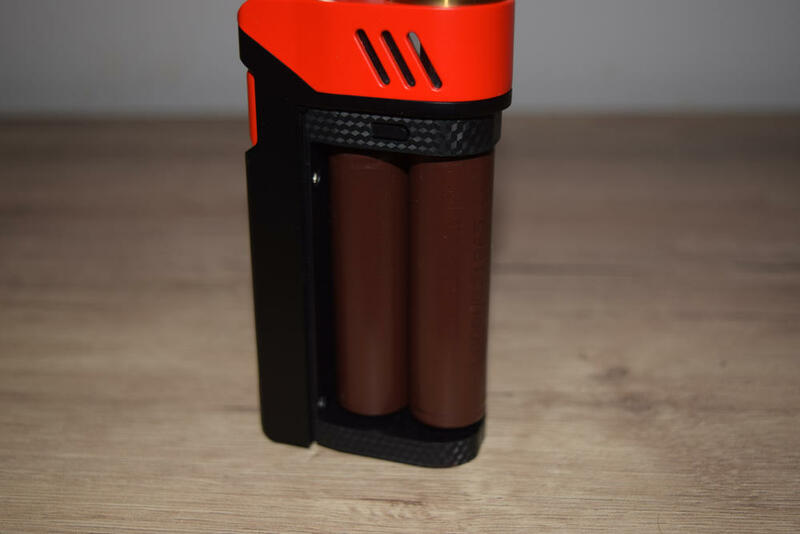 The RDTA Box has two tank windows – one on each side – cut into the body of the mod, but because most of the tank casing is opaque, the inside is pretty dark, so the company has also included a colored LED light that comes on whenever you press the fire button. This makes seeing the juice inside much easier, and if you’re worried about battery consumption, the LED feature can be deactivated from the setting menu. The first thing you need to do before using the iJoy RDTA Box for the first time is wash the tank, to make sure it’s nice and clean. This was the thing I was most worried about. because the tank is built into the body of the mod, you can’t easily clean it under running water. The risk of it finding its way into the mod and ruining the electrical components is too great in my opinion, so I prefer to play it safe. Luckily, there is a way to easily clean the tank by using a water container like a unicorn bottle. Start by removing the RDA cover, as well as the atomizer and the metallic ring that screws directly onto the connection hole, and grab that little round silicone cap that iJoy includes in the RDTA Box kit. Fit it over the connection pole, and you’ll notice that it insulates the entire hole completely. Then simply unscrew the metallic fill port cap, pour water inside the tank, screw the cap back on and shake vigorously. Repeat the process as many times you think is necessary. This way, the chances of getting water into the mod are extremely low. Drying the tank after you’ve cleaned it is a bit more complicated, especially if you like to be very through. 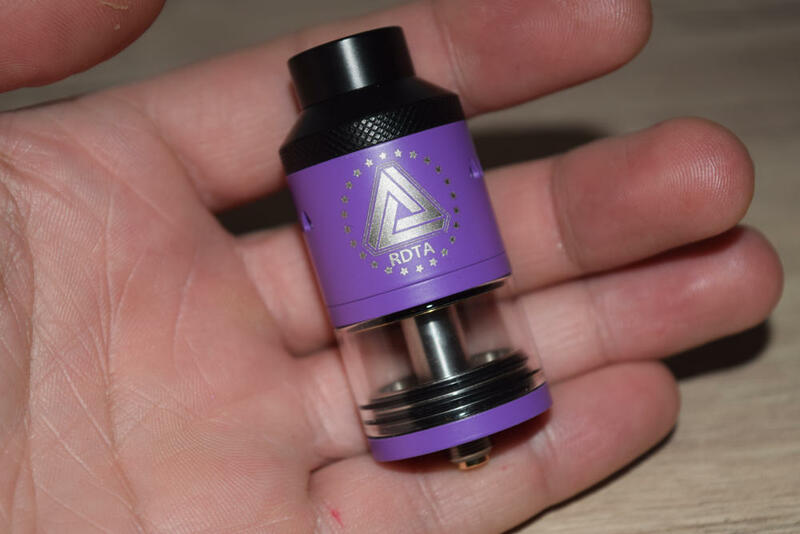 I for one just place the RDTA Box upside down, so the water can drip out of the tank through the two holes, and then just use a rolled-up paper napkin to reach any left-over water droplets. All you have to do then is fill the tank with your favorite juice, screw the pre-made coil or your favorite build deck onto the connection pole, put the RDA cover back on, and insert a couple of 18650 high-drain batteries. You are now ready to start vaping. Just like iJoy’s previous flagships, the Limitless Lux and MAXO mod, the RDTA Box features a Iwepal chip, so you can expect its menu system to be just as simple and intuitive. I said it before, and I’ll say it again – iJoy has the most user-friendly menu of all vaporizer manufacturers on the market today. The interface is nice and clean, you have all the necessary features available on the main menu screen, and browsing through the option is a breeze. To access the menu, just press the fire button three times in rapid succession. You’ll see a number of options show up on screen, though which you can browse by using the two metallic buttons located under the display. From top to bottom, we have three Temperature Control options (Ni200, titanium, stainless steel), Power/Wattage Mode, Rotate Screen, Pre-heat (Normal, Hard, Soft and User) and Settings (turn the LED on or off, and reset the puff counter). That’s about it. So you get all the functions that you really need from an advanced mod, and none of the useless fluff. 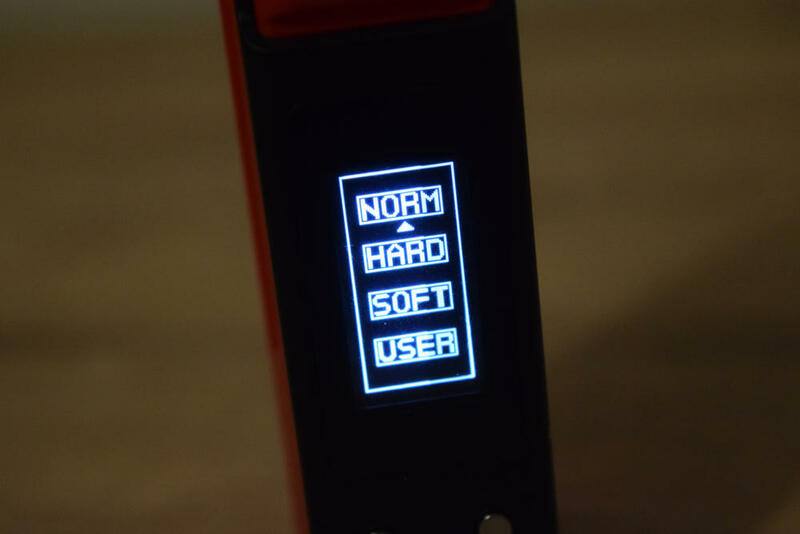 To select one of the various vaping modes, just browse through them, and once you’re on the selection you want, press the fire button and it activates. Then you can adjust the wattage and temperature on the home screen, with the two ‘left’ and ‘right’ buttons. The only thing you might have trouble figuring out from the beginning, is making adjustments in temp. control mode. 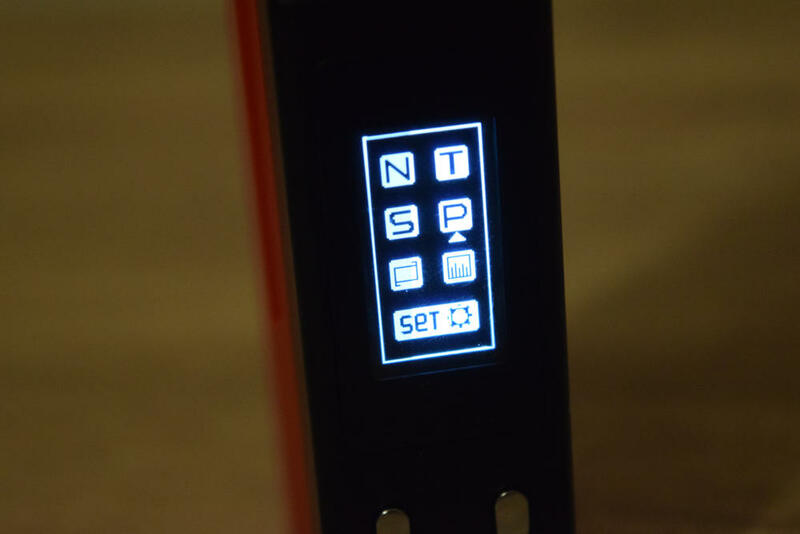 Once you pick a supported material from the menu and jump back to the home screen, depending on which one of the little buttons you press, you’ll be able to adjust the temperature or the pre-heat wattage. Press the ‘left’ button, and you’ll see the temperature symbol flashing. Now you’re able to adjust the temperature. You can do the same for wattage, by pressing the ‘right’ button first. To lock your resistance, just press the ‘left’ and ‘right’ buttons simultaneously for two seconds. The only thing I have been unable to find is the stealth mode (vaping with the display turned off). You’ll notice that I didn’t mention TCR. That’s because the iJoy RDTA Box doesn’t have a TCR adjustment function. That may be a downside for a few people, but let’s face it, most vapers (beginners, intermediate or advanced) never use TCR anyway. I for one didn’t miss it at all. All in all, it’s a very simple, user-friendly menu system that even a complete beginner would be able to use. I honestly hope that other companies – I’m looking at you, Joyetech – will take some cues from these guys on their future devices. The display of the iJoy RDTA Box is one of the nicest I’ve ever seen, as well. Both the screen itself and the font used to show the information are large enough to see clearly even while holding the device at a full-arm’s length away. The brightness cannot be adjusted, but the screen is bright enough as it is, so that’s not a big deal. This being an all-in-one device, you would expect the atomizer options to be somewhat limited, but thanks to the interchangeable RDA deck system that iJoy introduced with the Combo RDTA, you have access to virtually any type of coil configuration. The kit only includes a pre-made disposable triple coil-head and a classic Velocity style build deck, but you can buy about a dozen more decks separately, including a cool postless deck, Goon-style decks, and more. Also, iJoy seems to be constantly coming up with new compatible decks, allowing you to experiment with different coil configurations. I first started using the iJoy RDTA Box with the provided pre-made coil. Iwas so excited to try out this device, that I didn’t want to waste any time setting up the Velocity deck. The coil came ready for use, so I just screwed it onto the connection pole, added some blueberry doughnut juice, and I was ready to vape. It wasn’t the best vaping experience of my life, but it wasn’t terrible either. The pre-made coil is decent, but it does have a few serious problems. First of all, iJoy uses way too much cotton for the wicks, making it hard for the e-liquid to reach the three coils. That’s not a big problem if you vape at up to 50W, but going over that limit opens you up to the risk of dry hits. Another major problem is the three coil system. When you vape, it’s a good idea to tilt the RDTA Box, so that the juice reaches the cotton wicks, even if the tank is not 100 percent full. But due to the triangular setup of the three coils, one of them will always be higher than the other two and will not get enough juice. After about three days of constant use, I noticed that two of the coils had considerable gunk build-up, while the third was virtually clean as a whistle. It had not burned the cotton, so it was getting some juice, but nowhere near as much as the other two. As you can imagine, that also affects the taste of the vape. The second issue with the three coil-design has to do with airflow. 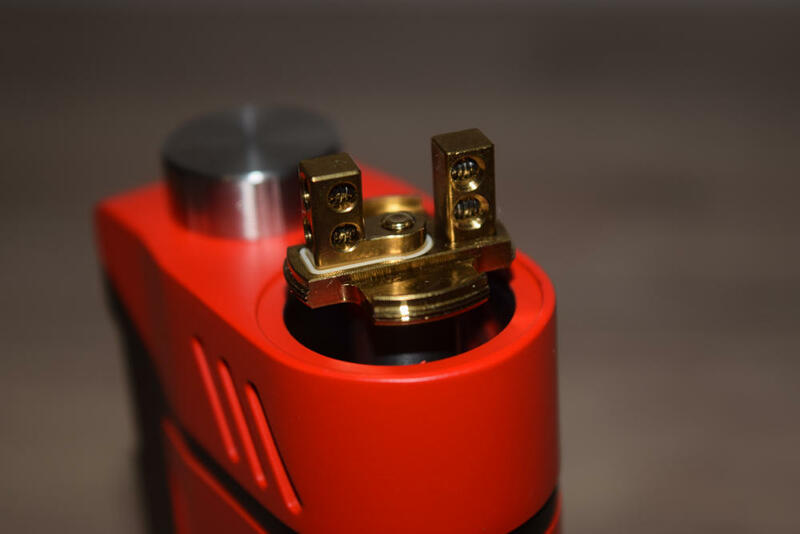 The RDA cover features two large adjustable airflow slots, but no matter how you turn it, you’ll only be able to expose two of the slots on the pre-made coil head. That means that when you vape, the air hits only two of the coils directly. 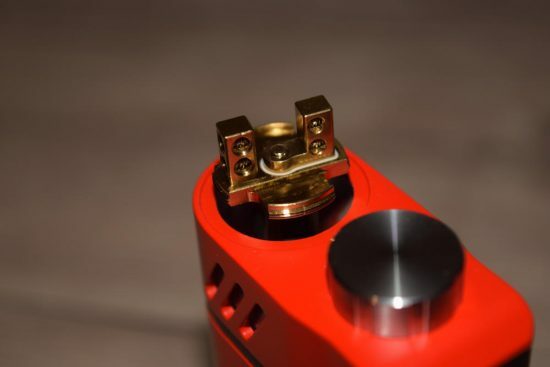 There is some space between the RDA cover and the coil head itself, so air does circulate through there, but we all know that the secret to an enjoyable vaping experience is direct airflow to the coils. This way, the taste is not nearly as intense as it should be. Using the Velocity deck changes the vaping experience completely. I used the coils provided by iJoy in that goody bag, which add up to a resistance of about 2Ω. Using the same e-liquid as before, with less cotton, at about 60W, I got a much better vape. The vapor production was about the same, but the flavor I got was ten times better. 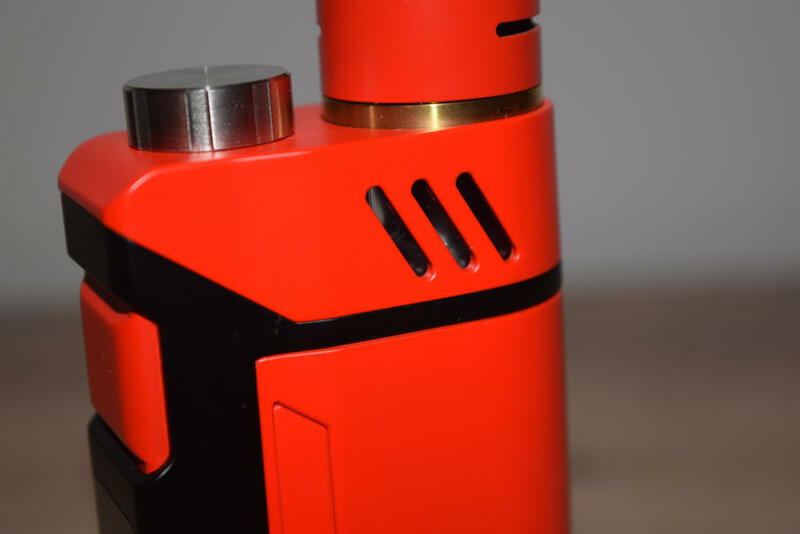 I plan on testing the iJoy RDTA Box with a few other RDA decks that I got for the Combo RDTA, but since the kit only contains that classic Velocity deck, I’m not going to post my opinion about them in this review. 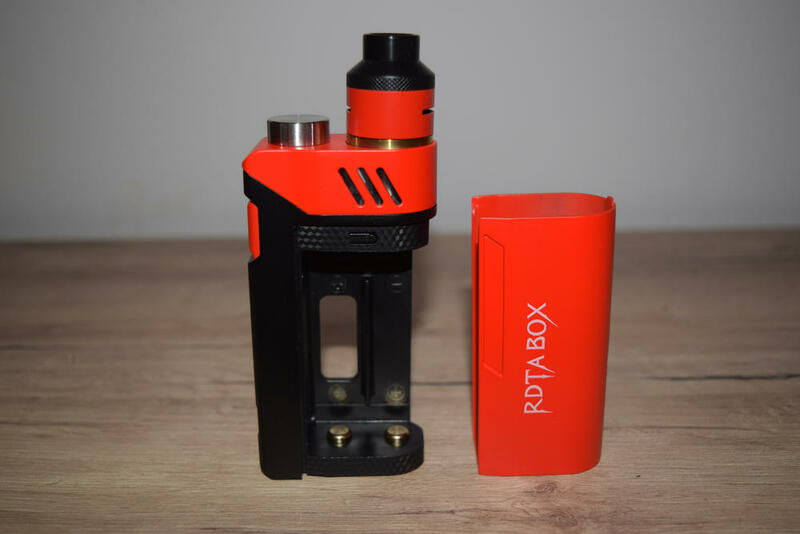 Bottom line – the pre-made coil head is decent, but for a truly spectacular vaping experience, I recommend using the iJoy RDTA Box with the interchangeable build decks. Otherwise, I have no issues to report. I’ve had no leaking issues with the RDTA Box, when using either the pre-made coils or the Velocity deck. With this sort of device, wicking plays a big part in preventing leaks, as does storing it upright, to prevent the e-liquid from flowing out of the large tank. Luckily, iJoy also includes a silicon sleeve for the RDA cover, which doesn’t allow the juice to leak when it’s not in use. The buttons are all very responsive, I’ve had no problems with misfires or other malfunctions. This thing just performs the way that it’s supposed to. That’s pretty much all I can say. If you’ve read any of my previous mod reviews, you probably already know that I’m not usually a big fan of temperature control vaping. That’s mainly because I’ve been kind of unlucky with it in the past. 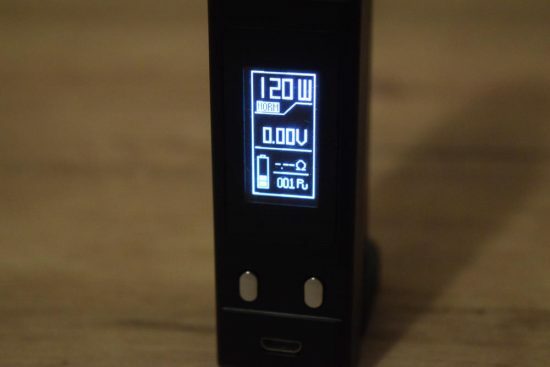 Some mods with either jump back into wattage mode if they didn’t like coils, or failed to deliver enough power to make the vape enjoyable, but iJoy devices have been the exception. I’ve never had these issues with mods like the Lux of the MAXO, and the RDTA Box seems to work just as well. It didn’t burn the cotton when I tested it, and it seemed to do a good job of controlling the temperature when vaping it in temp. control mode. I’ve only used this feature with stainless steel coils – the only material I temp. control these days – so I can’t comment about Ni200 and titanium. I have no doubt that the iJoy RDTA Box is going to be one of the Chinese company’s greatest hits. It has so much going for it, that I don’t see how it could fail. The massive built-in tank would have probably been enough to convince most advanced vapers that this device is worth their money, but iJoy also added the interchangeable deck feature for infinite customization options, 200W of power and all the advanced features that actually matter nowadays. That said, the RDTA Box is not for everyone. The size and weight factors are going to put off a lot of vapers that might otherwise consider buying it, but that’s something that iJoy has surely taken into consideration. This device is aimed at people who value large e-liquid capacity, atomizer versatility, long battery life and power, over portability. If you’re looking for something cute and easy to store in your small pockets, this clearly isn’t it. For me, the iJoy RDTA Box is a must have! The $79.50 price tag might seem a bit steep, but think about it for a minute – this includes both a high-power advanced mod and a high-quality RDTA system with an e-liquid capacity of 12.8ml. If you still think it’s not worth that much, at least wait for the price to drop, or hunt for sale prices, but get it! The iJoy RDTA Box was provided to me by Heaven Gifts, for the purpose of this review. The lastest firmware adds TCR capabilities and a couple of other things. I loved my Rdta until it started having 510 connecttor problems. There is no fix and honestly i wont buy anymore ijoy merchandise. They dont help either. Called ijoy and spent almost 1 hour waiting all so they can tell me they cant help me fix it.